Sherman was born on Feb. 8, 1820 in Lancaster, Ohio. His father was Charles Robert Sherman, a prominent lawyer who became a well respected justice on the Ohio Supreme Court. Charles unexpectedly died when William was only 9 years old. The loss would leave William devastated. His mother had been left with 11 children and no income. As a result, the children were raised by different families. William was raised by a Lancaster neighbor named Thomas Ewing. Ewing was a well respected attorney and the first Secretary of the Interior and a senator to Ohio. Despite the tremendous hardship that they all faced, most of the children would become very successful. William's older brother Charles became a federal judge, John a United States Senator, Hoyt a banker, Hugh an ambassador, and Thomas Jr. became a very successful lawyer. William Sherman married his foster sister Ellen Ewing and they had 8 children. He would try an assortment of careers, all of them unsuccessful. With no where else to turn, he enlisted in the military where he failed in his first command in Kentucky. Consequently, he developed low self esteem and became very depressed. However, he would quickly recover after his very successful command of a division in the Battle of Shiloh in 1862. At this time, he and Ulysses S. Grant would become very close. Before long, General Sherman captured Chattanooga, Tennessee. The Battle of Vicksburg had in effect cut the Confederacy vertically, east from west. Now, with his victory in Chattanooga, Sherman had a chance to bisect the Confederacy horizontally, upper from lower. 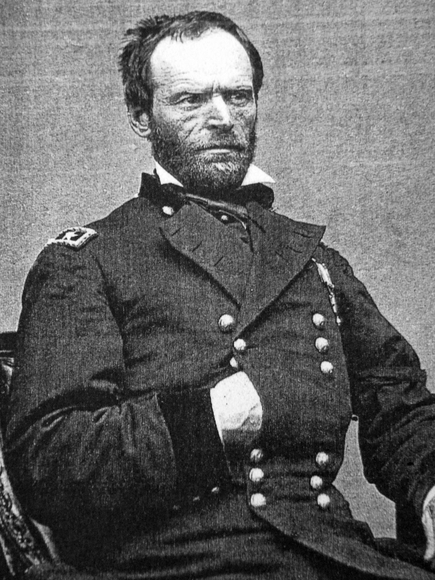 Before long, General Sherman and his men were fighting against the Confederate forces for control of Atlanta, Georgia. The Confederates were led by General Joseph E. Johnston who put up a gallant fight before losing Atlanta to Sherman on Sept. 2, 1864. The victory proved to be crucial in getting President Lincoln re-elected the following fall. He and his men destroyed everything of value in Atlanta. Against both President Lincoln and General Grants wishes, Sherman sent General Thomas northward to intercept General Hood's Confederate forces. He then promptly cut off all lines of communication and started his giant raid of terror against the South that historians have name the “March to the Sea.” The purpose was of the assault was to completely demoralize the South, and he did just that by implementing a “scorched earth policy.” General Sherman and his men burned, destroyed, and everything in their path. He and his forces were unstoppable. They systematically cut an enormous 60 mile wide, 300 mile long path of mayhem and destruction. Looting was rampant. They destroyed everything that got in their path, homes, farms, railroads, public buildings, bridges, and factories. At the same time, Sherman confiscated anything that he thought might have been of value to the Confederate forces. He burned Savannah, Georgia on December 22, 1864 and shortly afterward burned Columbia, South Carolina(the capital) on February 17th, 1865. During the month of April 1865, as the war crawled to an end, Sherman accepted the surrender of all of the armies in North and South Carolina, Georgia, and Florida, then after Ulysses S. Grant was elected president in 1869, General Sherman became the Commanding General of the Army. He served from 1869 to 1883. At this time, Sherman took part in the planning of the destruction of the Plains Indians. At the same time he was actively recruited as a candidate for president on the Republican Party ticket. However, he wasn't interested.